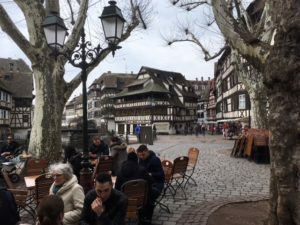 Strasbourg has been cold and mostly wet, but in no way has dampened general enthusiasm for this beautiful and compact city, essentially on an island surrounded by the river and canals. Our hotel Cour de Corbeau is an elegant and ingenious remodelling of about 20 half timbered houses and commercial buildings, all huddled together for hundreds of years and now comprising a beautifully decorated and comfortable complex. Wet weather has compromised our strolling in the city, but the hotel’s comfort has compensated. Our excellent city guide took us more indoors than expected (because of the weather) and the remarkable cathedral in particular, and helped us better understand the complexity of this lovely Franco German city. Departure day to Strasbourg from Paris. Bus to Gare l’Est, fast speeding TGV to Strasbourg and in less than 3 hours we are sipping tea in the Cour de Corbeau, a 16c medieval building with 21c amenities. A couple more hours and we are now sipping Crement Rosè and eating dinner together as we welcome all of us to the start of Easter Festival tour. 18 people from all backgrounds and places: Qld, ACT, London, NZ, and of course Sydney and Austria. Bravo Antony for once again making this all happen. Tuesday 27 March. Chilly, brisk, crisp morning to explore the city with a local guide The oldest cathedral in Europe taking 4 centuries to build with 320 steps to the roof (which I climbed!) we arrived in time to see the astronomical clock change to demonstrate the passing of time as the figure passes death. Incredible. We finished the tour at Eglise Saint Thomas with an organ built by Silbermann and played by Mozart and Albert Schweitzer in this fine Lutheran church. 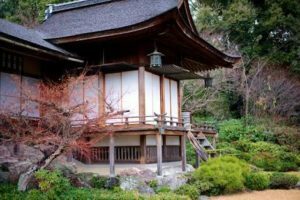 Only one performance was scheduled for our three day stay, the Japanese composer Mayazumi’s opera The Golden Pavilion, based on famous novelist Mishima’s 1956 novel about the true story of a disturbed novice monk’s arson of the ancient Kinkaku-ji temple in Kyoto. Presented in the relatively intimate traditional theatre of the Opéra National du Rhin, it was a straightforward production, with simple staging and using lighting to highlight the complexity of the protagonist’s delusional obsessions. Musically stark and uncompromising and much of it composed with twelve tone techniques, the dramatic argument was fairly clear despite the use of two singers to demonstrate (presumably) the contrasting aspects of the protagonist’s personality. Despite the significance of the extraordinary events it dealt with and the serious and high quality performance, I found it ultimately unsatisfying and hard to enjoy. Many of our group disagreed and found it very moving. For me the most outstanding experience in Strasbourg was the fortuitous opportunity of a performance of JS Bach’s Matthew Passion. On our third morning Sally saw a leaflet advertising the performance that night, our last in Strasbourg, so we quickly put it around amongst the group and most agreed to come. We bought tickets and arrived early as seats were not reserved and found excellent seats in the very large church. La Chapelle Rhénane is one of Europe’s leading baroque choral and orchestral ensembles, so it was a special thrill to stumble on this performance, that turned out to be as good as you could hope for and featured an especially eloquent Evangelist in Daniel Schreiber and the director Benoit Haller’s wife Salome Haller as alto. It was a very moving performance and as we donned our raincoats and umbrellas leaving the church and headed for a cold wet two kilometre walk back to the hotel, it seemed suitably spartan and spiritually drenching. Sally says: The Lichtenthaler Allee started life as a narrow medieval track (where an assassination was attempted on Kaiser Wilhelm) and is nowadays a world famous boulevard to walk, cycle or stroll. It features magnificent mature trees about to blossom, ornate bridges over the River Oos, majestic hotels, bathhouses and elegant mansions. We walked to its end and back to enjoy soup in the Cistercian abbey. 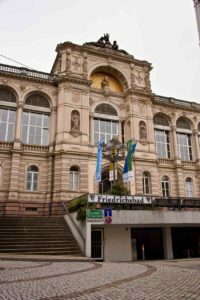 Our first performance in Baden Baden gave us several of the section principals of the Berlin Philharmonic added to the brilliant young players of the German Youth Orchestra under Simon Rattle. Each year the Philharmonic players tutor the cream of young German musicians selected to come to the Festival. After a terrific performance of Bartok’s early ballet suite The Wooden Prince, two of the young musicians presented Simon Rattle with a gift and between them made a speech of thanks as it was his last time he conducted the orchestra in this capacity. The Festspielhaus organisation has a major commitment to youth music experience and education funded by the creme de la creme of the German corporate sector, and Rattle has been a prime mover of this over the last 20 years. The big number both for the Festival (and for our tour) took place the next night (Good Friday) with a new production of Wagner’s Parsifal. Directed by Dieter Dorn, an older generation ex East German opera and theatre director now in charge of the leading theatre company in Munich, and of course conducted by Simon Rattle, it was played, cast and sung with the utmost refinement. The Gurnemanz of Franz Josef Selig, Amfortas with Gerald Finley and Kundry of Ruxandra Donose were all ideal in their parts; only Stephen Gould’s Parsifal could be bettered, though he sang well, but his awkward large frame and clumsy movement, like a tail wagging St Bernard, made him anything but a golden haired young hero. Many of us didn’t much like the production with the settings consisting entirely of grey pyramidal shapes being pushed around on wheels to form different abstract scenic locations. While I thought there was too much unnecessary pushing around, I felt they worked quite well to form symbolically suitable settings for what are after all very unspecific locations for the slow, unfolding story. 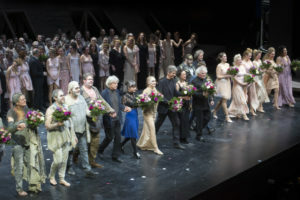 The very naturalistic treatment of the individual members of the chorus as real people caught up in the drama was very effective and contrasted with most modern productions where they stand in rows or process in line and their only function is to occupy part of the stage and sing. All told, it was an absorbing and beautiful performance, undistracted by egotistical production values. However, now having seen many productions of Parsifal, I have to admit it unfolds at glacial pace, and for all its wrapt beauty, in this 21st century time-constrained age, it could do with some extensive cuts, especially in the endless Klingsor/ Kundry duet in the 2nd act. The morning after Parsifal, Sarah, Robin and I soaked naked in the thermal mineral waters of the Friedrichsbad, an elegant bathing complex that originally catered to European aristocracy. We followed a 17-step bathing ritual that included a sequence of hot air baths, steam rooms, showers, pools, and optional massage. We shared a slightly awkward but fabulous experience! We began with a hot shower with huge shower heads to get started. This step is meant to get us clean and also adjusted us to being naked with strangers. After the shower, we took out towel and plastic slippers to a warm-air bath, lying on a towel on the wooden lounge chair. It was so peaceful and I loved the beautiful flower and bird tiles on the wall. Next was a really hot air room with more wooden lounge chairs but I had a hard time staying in this room for more than a minute. Then back to the same showers before a Soap and Brush massage. Lovely! Next we have thermal steam baths. We sit on a little napkin on the marble and enjoy the steam, take another shower before moving to the pools. They began warm and become increasingly cooler – both thermal and whirlpool. The most beautiful and majestic pool was the un-segregated one which we skipped – but it has the best view with a wonderful dome. It’s the area of the spa when we could best imagine the majesty of one of the grandest bathing houses in Europe. Next was a series of cold and very cold pools – only Robin braved the coldest. The final two rooms are for pure relaxation. In the first, you are quietly guided by an attendant into a dark room filled with raised beds covered in clean sheets and blankets. You are then each individually wrapped into a warm, soft cocoon to relax and sleep. It reminded me a bit of the sleeping pods on the Alien movie! After we broke out of our warm little cocoons, we were then directed to he final Reading room. This is a sunny room with chaise lounges, big warm towels, magazines, and warm tea. Looking back this was such a wonderful experience and it was definitely a highlight of time spent in Baden-Baden. PS. To my great surprise, the next day Antony went off through the same ritual at the Friedrichsbad – on the mixed gender day! Our next concert offered Simon Rattle a rest day and the orchestra was conducted by another great maestro, Ivan Fischer, founder and artistic director of the superb Budapest Festival Orchestra, and a regular with the Berlin Philharmonic. Young Norwegian violin virtuoso Vilda Frang, tall, blonde and elegantly dressed in ankle length gold, tossed off Bartok’s First Violin Concerto with unruffled poise. An early work, not even published in his lifetime, in its contrasted two movements, it is said to portray his early unrequited love Stefi Geyer, also a violinist, in the dreamy opening movement and his own turbulent self in the second. The second half of the concert was devoted to Mendelssohn’s delectable Overture and Incidental Music to A Midsummer Night’s Dream, the first and arguably the finest musical representation of Shakespeare’s great comedy. Unusually, we were given the full choral version with soloists of the Incidental Music. The delicacy of the Berlin Philharmonic’s playing had to be heard to be believed. In a perfect conclusion to our musical offering in Baden Baden, Rattle returned to his orchestra with an intriguing but rarely played work, Bernstein’s The Age of Anxiety, a piano concerto in all but name, based on a WH Auden narrative poem about four strangers meeting in a New York at the end of WW II and imagining a new and different post war world. The soloist, the great Polish virtuoso, Krystian Zimerman, had been a friend of Bernstein and has been a champion of the piece during his career. It is a chameleon-like piece going through a complex variety of moods and styles, typical of Bernstein’s eclecticism, but always full of his passion for life and experience. It requires a huge orchestra with large solo parts for many of the musicians and the demands for the pianist are huge, requiring poetic pianissimi through popular song, jazz and complex counterpoint. it was a thrilling performance and our group loved it. The concert ended with a performance of Beethoven’s Eroica symphony that was an eye-opener showing what an amazing experience it can be with a great orchestra taking on one of classical music’s masterpieces. Rattle fined down the orchestra to early 19th century forces of fewer than 50 players. Tempi were brisk and the sound was lean but with perfect intonation and the most delicate sound in soft passages but precise and forceful where the music required it. The experience was not unlike the way Richard Tognetti directs Beethoven symphonies with the ACO with the added refinement of the Berliners and Rattle’s great skill in balancing each section so that no subtlety of expression is lost. 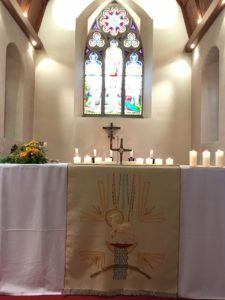 To worship at a beautiful Lutheran church in Baden-Baden was so special. I thought our bath experience was a highlight but the Eucharist celebrated in the German language was even better. 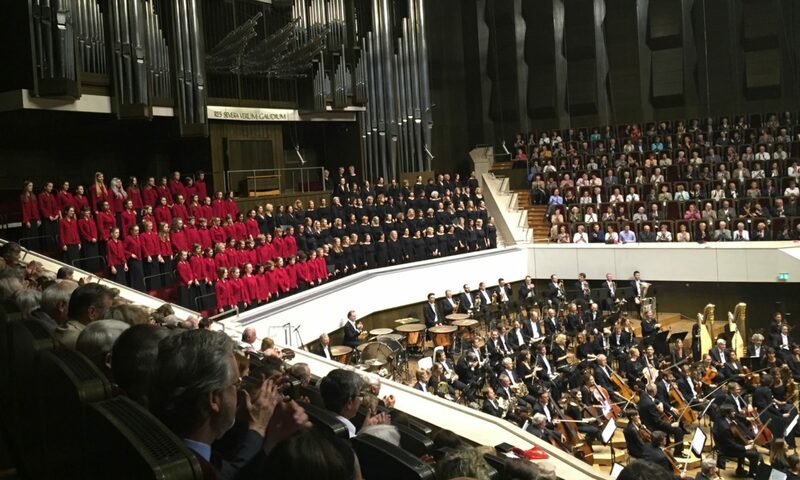 Hearing “Come all you people” from the Messiah the sound of “Panis Angelicus” sung from the height of the organ loft and performed by members of the Berlin Philharmonic chorus was beyond anything I had imagined. 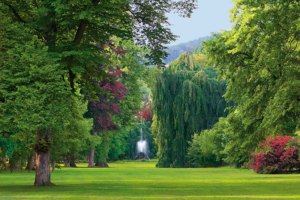 Walking through the suburban streets of Baden Baden early on Easter morning in the very crisp cold weather having shared the common cup and then sharing coffee and biscuits with parishioners after the service was glorious. Travelling from Baden Baden to Aix on the TGV was quite an experience, but not one we would want to repeat. We remain grateful for everyone in the party being so helpful in getting themselves and the luggage on and off the train in breakneck speed during such short stops. But the lesson was well learnt that we should never again board or exit a train with such a large group, unless at the terminus of the route. In particular we are grateful to Chris Smith and Claudia for their efficient organisation. We didn’t arrive at our hotel in Aix until late and sat down for our second group dinner of the tour barely a few minutes before 11. The Aquabella hotel had everything prepared and we had a long table in the dining room entirely to ourselves. A good thing too, as there were 20 ravenous people and their hubbub would have terrified other diners silly enough to be eating at another table. For Sally and me it was a thrill to be in Aix again; such a beautiful small city with the stone of its old buildings glowing pinkish yellow in the sun. After a guided stroll around the city in the morning, our first concert took place at the brand new Darius Milhaud conservatory hall with a superb recital by the great flautist Emmanuel Pahud (having a day off from his regular job at the Berlin Philharmonic) with the Georgian pianist Khatia Buniatishvili. The program included Romantic chamber music pieces by Schumann and Schubert the former arranged for flute and piano, though originally composed for Clarinet. The Schumann Fantasiestueke is in three little movements and was a wonderful piece for Pahud to display his gorgeous rich tone and breath control. The Schubert Variations on the theme of the song Withered Flowers from his Maid of the Mill song cycle was less successful, even though written specifically for the flute this time. The song is sad and mournful but in this piece, after the statement of the melody, it goes through a long sequence of rather cheap and cheerful variations mostly to show off the cleverness of the flautist, spoiling the effect of the original song. After the interval, Pahud really got into his stride with a superbly atmospheric performance of Debussy’s L’apres midi d’un faune, a land mark piece of musical impressionism, usually for orchestra. Then the stage darkened and invisably he played Debussy’s remarkable three minute solo flute piece Syrinx, a quiet, abstract piece of no specific tonality that at the time of composition, was a revelation of flute practice. The effect of these ethereal sounds coming out of the darkened hall was mesmerising. The biggest piece of the program was Franck’s Violin and Piano Sonata, one of the supreme works of the genre, arranged for flute and piano. It was a tour de force and resulted in sustained applause and cheers from the audience. 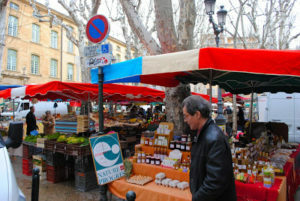 Our days in Aix have been so enjoyable despite still surprisingly chilly weather. The early Easter this year has the advantage of fewer tourists and we now have glimpses of real warmth emerging in the Provencal deep azure sky. 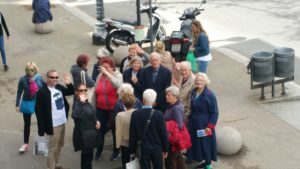 We organised a coach to the Luberon, a mountainous region north of Aix, the real heart of Provence and the location of many picturesque villages. 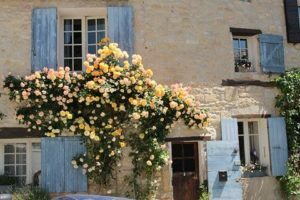 We spent time in three villages, all of which are listed as Plus Beaux Villages de France (Rousillon, Lourmarin and Ansouis). They gave us a taste of the charm of ancient Provence, putting us in touch with a 2000 year old Roman bridge, origins of the Marquis de Sade, lavender fields, the first white asparagus of the season in the foodstalls, and colourful old houses and monuments. All the villages we visited are on the top of hills overlooking valleys and both cultivated and wild fields. The deep red ochre of the hillsides and cliffs of Rousillon viewed from the little terraces at the top of the town were especially spectacular. 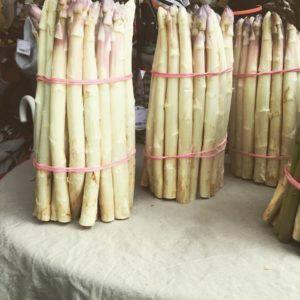 First white asparagus in Roussillon. Our next concert in Aix was at the Grande Théatre de Provence, a splendid newish hall with good acoustics, with an auditorium similar in style and size to the Llewellyn Hall in Canberra, but also apparently convertible for opera performance, where the opera is performed during the Opera Festival in July each year. We heard the much acclaimed French conductor Laurence Equilbey, a specialist in Classical repertoire of the late 18th and early 19th centuries, who has her own Insula Orchestra and Accentus Choir, performing the “Great” C minor Mass of Mozart, arguably his most profound and substantial choral work, though it was never completed. It was a serious and noble performance, no doubt suitable for Easter, but rather gloomy, and, dare I say, a little dreary for a Festival audience. For me it was enlivened by the sensational singing of French soprano Sandrine Piau, who in a slinky sparkling silver dress, looked as good as she sounded. Sally and I also were struck by the extraordinary hair of the timpanist who looked like he had a large yellow tea cosy plonked on his head. We had a rendezvous with our Swedish friends Lars Brolin and Barbro in the nearby village St Martin that after so many years is a dream come true. For more than 30 years we’ve heard about the house in Provence that Lars built more or less by hand and now finally we were to see it! We caught a bus, were met by Barbro and given a wonderful lunch in the sunny courtyard with boeuf bourguignon, washed rind cheeses, almond tarte, and a delicious red gignondas rhone wine. To meet Ida, a loving wife and mother of two little girls when last seen as a 9 year old was simply marvellous. Thank you Lars and Barbro. 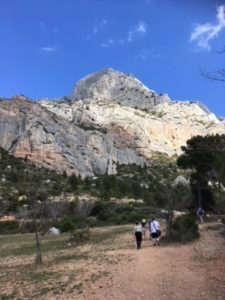 Once again we return after some years to this spectacular region near to Aix, a favourite place where Cezanne frequently painted (and where he ultimately died) to climb around Mont St Victoire, this time bringing with us the more athletic members of our group. A wonderful day, warm and sunny, but Antony underestimated its length and the extent of the climb. He told us afterwards that on our earlier visit, we had walked in the other direction which was much less steep. So it turned out to be quite exhausting for some of us. However, in the end we all made it through safely and we really did have a magnificent Provencal experience with the deep blue of the sky of blue and fabulous views of the wild maquis bushland free of virtually of any other people. Our final two concerts in Aix were greatly contrasted. At the tiny theatre Jeu de Paumes, we had an intimate recital of mostly French songs by young French mezzo Catherine Trottmann, still in her mid-20s and looking fabulous in a form fitting red dress. On the last night we returned to the Grand Theatre de Provence for an altogether larger-scale all-Brahms concert with Estonian conductor Paavo Jarvi conducting his Bremen Kammerphilharmonie. The Brahms was a thrilling concert with a big dramatic performance of the First symphony concluding the concert. The loud banging of the timpani in the introduction to the first movement seemed musically totally wrong, but there was no denying the power of the whole performance. In the first half we heard yet another brilliant young female musician, in this case 29 year old German violinist, Veronika Eberle, a true virtuoso, playing the Brahms Violin Concerto with enormous authority and not an ounce of ego. Despite Eberle’s playing, I found the song recital at the Jeu de Paumes a more intriguing concert. Though very young, Trottmann is an accomplished artist with an ability to merge her singing with her appearance and personality and offer a total performance. She chose a diverse and challenging program of mostly early 20th century song that happens to be the very best of French song. Her choices of Ravel and Faure and even the Parisian Venezuelan Reynaldo Hahn require experience and sophistication to bring them off. 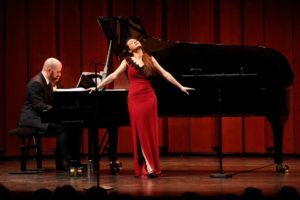 Many of the songs are party pieces for divas like Renee Fleming and Joyce Di Donato and all credit to Ms Trottmann for not holding back. While she will sing this repertoire with more oomph and panache in ten years time, it was a lovely recital and proved she is a singer to watch. 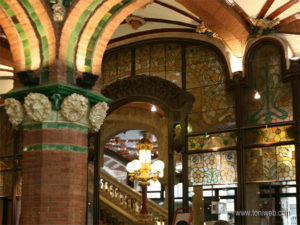 On Saturday 7 April we took a coach all the way south west along the French coast to Barcelona. it took most of the day but was quite relaxing and gave us plenty of time to check in at the Hotel Barcelo Raval and find something to eat for dinner. The hotel is new and very different from what we are used to. A multi-level cylinder covered in grey metal shutters, and emitting a blueish glow, it looks more like a space shuttle preparing to take off than a hotel. The ground floor has all the public facilities, like dining, reception, bar and lounge in an open area. The roof gives fabulous views of the city through 180 degrees, and the rooms, shaped like wedges, are set up unlike anything you have experienced in a hotel before. I liked it, but some found it disconcerting and at least one remarked that they would never set foot in it again. 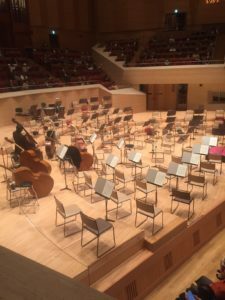 On the Sunday morning we had an early 11 am concert in the relatively new performing arts centre, L’Auditori, a large plain and functional looking multi purpose building, and the home of the Barcelona Symphony Orchestra. The concert was part of a series of concerts for emerging soloists and the demanding program featured two concertos, Shostakovich’s Cello Concerto no 1 with a young British cellist and Prokofiev Piano Concerto No 1 wirh a young French pianist, plus Respighi’s The Fountains of Rome. The cellist Sheku Kanneh-Mason, was only 19 but gave a terrific performance. The Prokofiev suffered greatly from a terribly muddy acoustic in the hall and was virtually inaudible. Such an inadequate acoustic in such an expensive new complex is disgraceful. It was a big day for us as most of us attended a concert performance of Verdi’s early opera Attila at the great opera house Gran Teatre del Liceu. In advance I wondered whether a concert performance of a little known opera with a cast of sub-international names was worth attending. How wrong I was! It turned out to be one of the highlights of the tour. We had splendid seats in the stalls and the soloists were lined up across the front of the stage with the orchestra on stage behind them and the chorus at the back. The performance was sensational, due in part to our close proximity to the singers, but also because all had terrific big voices, and freed from dealing with stagecraft and movements, could stand and belt it out. The Attila, in particular, Russian bass Ildar Abdrazakov had a fantastic stentorian voice, well matched by Italian dramatic soprano Anna Pirozzi, who marched on stage early in the piece in a most unflattering floral gown, opened her mouth and nearly blew us out of our seats by the sheer volume and brilliance of her sound. In the interval we repaired to the grandest and most elaborate gold decorated lounge for drinks, enormous and no doubt created at the height of early 20th century grandeur. After the opera we walked out along La Rambla stunned by the performance, hurrying back to our nearby hotel in the rain! Barcelona is a truly fabulous city, and even though much of it appears down at heel and in need of some paint, the great squares, gardens and boulevards speak of a city of power and elegance. During our guided city walk, some of us talked to the guide about the continuing independence crisis for Catalonia. It seems to have become a most unsatisfactory deadlock with the central government in Madrid refusing to compromise and many of the leaders of the rebel Catalonian government either in prison or stuck abroad and unable to return. Our guide told us the intransigence of both sides is starting to irritate the people, most of whom want a settlement of some sort, though this seems to be a long way off. Two weeks after our tour we spent a few days in Basque country in Bilbao and San Sebastian (now called Donostia – the Basque name for the city). At the other end of the Pyrenees, the Basques have much more sensibly given up their previously lethal demands for independence and have settled for a swathe of special advantages from Madrid. The obvious prosperity of the Basque country seems to show pretty clearly the folly of Catalonian independence demands. Our visit to Sagrada Familia, the great church and masterpiece of Antonio Gaudi, was overwhelming. Even 80 years after it was started, it is still uncompleted, though modern building technology will allow Gaudi’s almost impossible ideas to be realised and completed, hopefully by 2026. 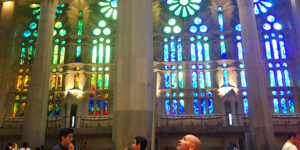 I found walking into it and being greeted by the riot of colour from its stained glass windows an extraordinary and very emotional experience. Not only the colours from the windows’ mostly abstract designs, but the profusion of asymmetric columns, arches, chapels, and vaults gives the interior a look of a gigantic spiritual garden full of enormous exotic plants and flowers. The exterior is just as fantastically extravagant and the profusion of slender curving towers, now surrounded by thin yellow cranes poking high in the sky gives a bizarre extra terrestrial look. I watched one of the cranes lifting a rosette for one of the towers being lifted across the church into the sky seemingly miles above the earth. Later we were taken to Parc Guell in the hills on the outskirts of the city, a huge public park completely designed by Gaudi and replete with his most fantastic shapes, colours and designs for a public place to be enjoyed by everyone. 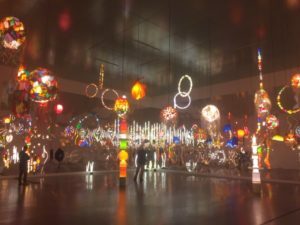 The overall impression is that you have landed up in another world of huge multi-coloured magic mushrooms. Gaudi’s house is on the edge of the park and it is wonderful to see the adoration by everyone who sees it of this strange, miraculous reclusive artist. In the evening we enjoyed our last tour performance. Fittingly, it took place at the fabulous Catalonian art nouveau extravaganza of a concert hall Palau de la Musica, completing a day of amazing visual, spatial experiences. We crowded in to the Palau de la Musica finding it relatively small compared to most symphonic halls, but the great art nouveau glass ceiling and the incredible detail of the high relief decoration on the walls, the ceiling, in the foyers, on the stairs and in every nook and cranny were inexhaustible. I found that an almost life-size coloured plaster horse a metre above my seat hanging from the ceiling. The performance by the top orchestra from Florence, Orchestra del Maggio Musicale Fiorentino conducted by Vladimir Ashkenazy of the Beethoven 7th and Tchaikovsky 4th symphonies was almost secondary to the splendour of the venue. However we all loved both the place and the performance and it was a real high note to end the music of the tour, especially the sight and sound of the cymbals player accidentally dropping his cymbal on the floor. Personally, I enjoyed the Beethoven more than I did Rattle’s performance of the Eroica in Baden Baden with the Berlin Philharmonic. Ashkenzy prefers a more traditional 20th century style of playing Beethoven with steady tempi and more generous phrasing, rather than the swift and clipped style that Rattle gave us and is so prevalent today. 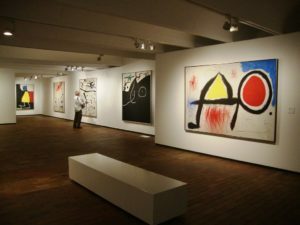 Our last day saw us enjoying the Miro and Picasso museums in Barcelona. The Picasso is devoted largely to his early works and obviously defers to the major museum for the great artist in Madrid. A couple of weeks later Sally and I went to his museum in Paris which was showing a remarkable special exhibition of the origins and effects of the famous Guernica painting installed in Madrid. The Paris exhibition was fascinating in giving a detailed analysis of the profusion of cultural and personal references in Guernica and how they developed in the many stages and versions of the painting before he settled on the finished version. For someone like me who had always thought it was a painting done in the white heat of outrage over the Spanish civil war, it was a revelation to learn how much thought he had put into it over a long period. Somehow it had become an amalgam of the deep personal and cultural influences of his life that had been gathered together to focus on the political cruelties of that age. We reached the Miro museum in the hills on the edge of Barcelona by funicular. 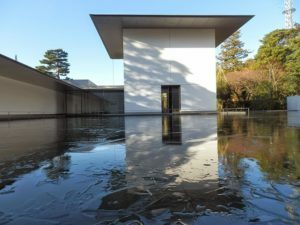 A beautifully designed gallery, largely defined by his requirements, it is an eloquent exposition of the great breadth of his artistic passions. 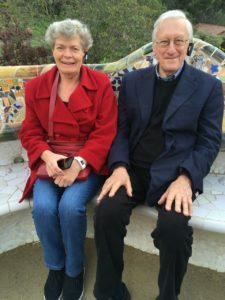 We were then scheduled to walk up to Montjuic Park overlooking the whole of the city but most of us decided to give it a miss and save ourselves for the farewell dinner. This took place in the restaurant across the street form the Barcelo Raval hotel. Sally decided to mix everyone up by putting place names on the table for everyone, and when we arrived the restaurant had set up a private room in most elegant fashion. I have to say we have hosted many tour farewell dinners before, but without doubt this was easily the best. The place looked lovely, the food was beautifully presented, tasty and unusual, and the wine flowed without stinting. The conviviality amongst the group was infectious and the noise level rose throughout the evening until it only be described as a din. 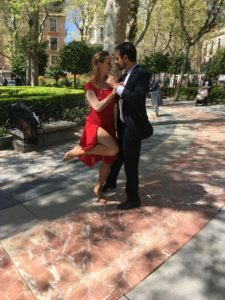 On the morning of 11 April we all departed from Barcelona, six of us to take the optional four day tour extension to Andalusia, while our tour manager Claudia and the rest of the party returned home or took off to other places around Europe. The six Andalusian enthusiasts flew to Seville and settled in a comfortable and very Spanish looking hotel called Fernando III, smack in the middle of the old town of Seville. While the tour’s scheduled musical performances finished in Barcelona, I was keen to experience an evening of flamenco seeing Seville is a centre of this art form. We found a flamenco lounge in a narrow old street not far from the hotel and enjoyed what seemed to be a very professional and authentic performance. It was very informal and seemed to be led by a pudgy middle aged man who played guitar and sang. Three other younger singing guitarists alternated with him both as soloists and in ensemble. They all sang with an unusual edgy guttural sound that is clearly what is required. They accompanied three female and one male dancers, who danced mostly as solos, but occasionally danced together. Their colourful traditional costumes and carefully choreographed movements were delightful. The whole thing was very relaxed with the artists laughing and chatting to each other between numbers, and sitting in the audience when not performing. No food was served but we were all given a drink before the performance and could order more if we wanted. Altogether a terrific evening. 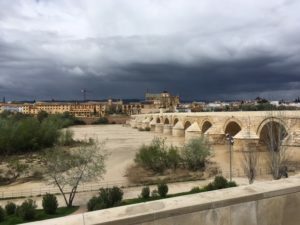 The next day was cold and wet, not what we expected of Andalusia, and we were not pleased that we had to walk half way across the city in the rain to meet our guide Teresa, only for her to take us most of the way back to start the visit to the Real Alcazar and the Cathedral. The cathedral is immense, the largest Gothic cathedral in the world, surpassed in size only by St Peter’s in Rome and St Paul’s in London. It is gloomy (maybe because it was a wet day) but its sheer size gives it a dark magnificence, like a half lit Rembrandt painting. The main chapel (Capilla Mayor) is extraordinary with the retable above and around the high altar of astonishing size and golden detail, though through the screen before it and in the semi-darkness, the detail of the 45 separate high relief biblical scenes, was not easy to make out. 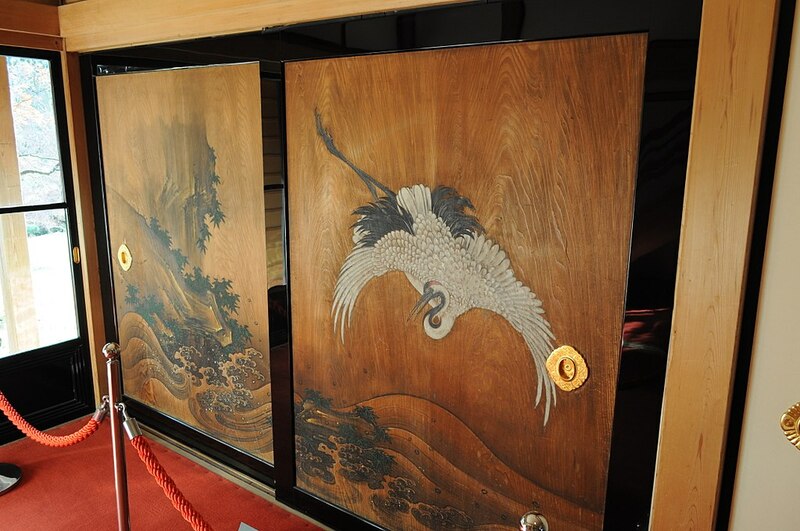 However discreet search lights wash over the whole area and help the viewer to see more detail of the exquisite carvings. From outside, the Cathedral is so large it looks more like a city in itself. Its profusion of Gothic towers and decoration is overlooked by the Giralda Tower, the one remaining element of the Moorish mosque that was built in the 11th century. Seville was recaptured by Ferdinand III in 1248 and over the next two centuries this mighty cathedral was built. The guide then took us to the Real (Royal) Alcazar, the palace built around and replacing the Moorish palace. When Ferdinand III captured Seville in 1248, he and his notable successor Pedro I set out to rebuild the palace and what now stands of the Alcazar is their work and is regarded as the finest example of Mudejar architecture. The whole place takes a huge entire block in the middle of the city and is full of splendid buildings and gardens. 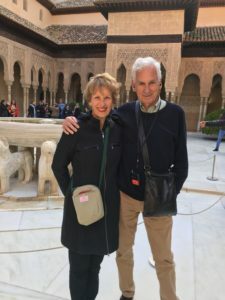 Because of the rain we spent most of the visit in the interior which features the typical horse shoe arches with their incredibly slender pillars and elaborate Moorish geometric decorations on the walls. Most of the walls, especially in the lower sections are covered in patterned ceramic tiles of many colours. 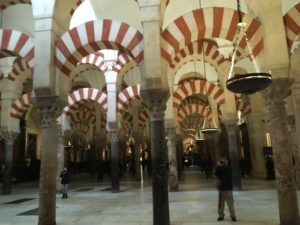 We caught a mini-bus the following morning to Cordoba to see the great mosque Mezquita and then on to Granada; a long day but it proved to be well worth it. Cordoba is 200 kilometres north east of Seville on the banks of the huge Guadalquivir river. The view of the massive Mezquita mosque from the southern side of the river across the ancient Roman bridge is a marvellous sight. The Mezquita is the largest mosque in the world built by the caliph Abd ar-Rahman III in the 9th and 10th centuries. From outside, a huge rectangular sandstone fortress on the north bank of the river, its appearance gives no sense of the phenomenal interior. It consists of no less than 18 parallel naves separated by endless rows of magnificent double semi-circular arches supported between two columns (one arch on top of the other). All the arches feature pink and cream or white zig zag patterns. The sheer spectacle and grandeur of these massive spaces with the hundreds of arches in rows has to be seen to be believed. In the middle of the mosque is another incredible sight. 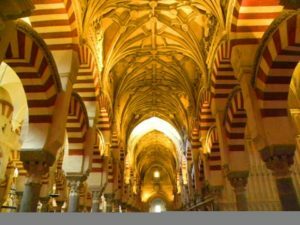 After Cordoba fell to the Christians in the 13th century, three centuries later a complete Christian cathedral in Gothic style was built in the middle of the Mezquita by demolishing a central section of the interior Muslim arches. The cathedral itself is a splendid medieval church of great size and presence. What an amazing place the Mezquita is! After we crossed the Roman bridge over the Guadalquivir, we made no further attempt to explore Cordoba, but took the mini-bus on to Granada. Approaching Granada, with its hills framing it, I thought I could identify the long anticipated Alhambra nestling long, flat and reddish grey in the hills above the city. As we got closer, I saw I was right. We arrived in the centre of the city to the Melia hotel, looking smart and elegant and checked in. In actuality it wasn’t as good as the foyer promised and Sally had to do a number on the elderly desk manager when she discovered our room was not to her liking, but then I have become used to this charade. We ate at a very traditional Andalusian restaurant that night that had plaques on the wall about the famous artists and politicians who had eaten there including Lorca and Picasso. The Alhambra was the last big experience of our tour and it was well worth the wait. Claudia had booked us to start late to avoid the crowds, an excellent idea and the six of us took two taxis the quite short distance up the hills behind the city to the entrance, arriving at about 4.30. We met our very knowledgeable guide, who explained the background to the complex as we wandered through the beautiful gardens at the top of the site with superb views down over the city and along the ridge towards the main palace. The gardens feature long cultivated walk ways lined with cypress pines flanking long shallow pools with lush ornamented flower gardens alongside.You enter and exit open and closed pleasure pavilions, lined with elaborate geometric patterns on the walls, many by means of ceramic wall tiles. 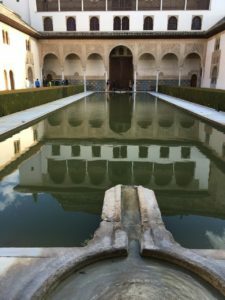 One exits on to a 50 metre long waterway like an ancient long slender infinity pool, except the whole enclosure is bounded at each end with intricately decorated walls with slender arches. 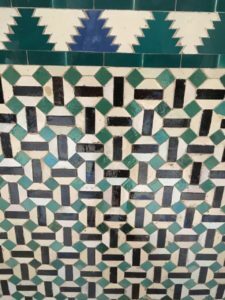 Then we move into a series of ever finer and more spectacular halls with colourful geometric wall and floor patterns and delicate arches. One of the loveliest features is the way you come across intimate vistas from windows, secluded balconies, or simply slits in the walls. Another special charm is the fact it is located high in the hills over the plain and the city, and every aspect has beautiful views. No wonder the Alhambra is one of the most beloved and visited cultural sites in the world. Our visit lasted three hours but not a minute was wasted. It was the perfect way to finish our tour. The next morning we went our various ways, Sally and I to Lisbon for a short Portuguese holiday, our first visit to the country. In Seville, Teresa our guide took us to the Cathedral of Santa Maria – ‘so exquisite no other would compare’ per a 1401 quote. I have to say that despite seeing magnificent Notre Dame, the English, European and even the Washington Cathedral and only 2 days ago Gaudi’s Sagrada Familia in Barcelona – this cathedral had me utterly gasping. Something about the transition from Moorish to Christian maybe or just the colossal size and wealth of the alter, huge roofed domes and columns that tower over us had me incredulous. It’s been plonked into the hollowed out area of the Mosque. However it was a pity it rained because Seville is the proud capital city of Andalusia and it was difficult to gain the extent of its charms. Teresa told us about the making of sherry, the orange trees, flamenco and the different Arabic influences and traditions. And of course the great changes made by Ferdinand III and Isabella. The other major site were some of the rooms of the royal residence and palace (Reale Alcázares). It is here that complexity of the past is revealed and the origins dating back to the early days of Arab rule. I wasn’t sure if I might’ve been looking at the Taj Mahal! How magnificent building of many aspects of his Mudejar tradition blending with Spanish and Christian design features, even a Star of David! I wanted to go to the old Jewish quarter in the evening as I had been advised to do so but the weather really prevented us doing that. I particularly wanted to find out a bit more about the Inquisition. 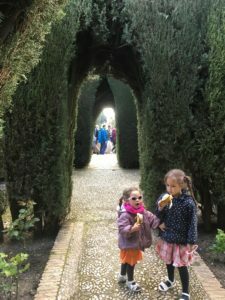 The tour of the Alhambra included the beautiful Gardens followed by the three Palaces. The garden beds are changed every two months so they are always in bloom. They are truly beautiful. Gorgeous ancient cypresses and of course numerous pomegranates, the emblem of Granada. Our guide told us the pomegranate has 613 seeds and the shape of the fruit can be found in the stucco walls of the design in the palaces. He also told us the apparently geometric wall and floor patterns are in symmetry to indicate perfection. Allah is not allowed to be visually represented thus perfection is in symmetry! The extensive long Moorish history, the rule of the Catholic kings, the effect of the discovery of the new world and Christopher Columbus, Peter the Cruel, Phillip etc etc all goes into the melting pot of this marvellous Iberian history of which I and many of us educated in post-Renaissance history are foolishly ignorant. One fact I had never heard was that the Alhambra fell into decline for a long period until the US Ambassador Washington Irving came in the 1890’s. It was then that he heard the ancient stories and tales and so wrote a collection called: Tales of the Alhambra. It was for this reason that it was then restored and returned to its rightful glory. Seeing most of our travel in recent years has been in Europe and most in connection with our music tours, we thought we should next time we have the opportunity to go over seas we should go somewhere we’ve never been before. Japan! That was an easy decision: but when I thought about it, it didn’t seem easy at all. I have always thought them an inscrutable people, polite but remote, their language incomprehensible, and their culture, both modern and ancient, very distant from ours. 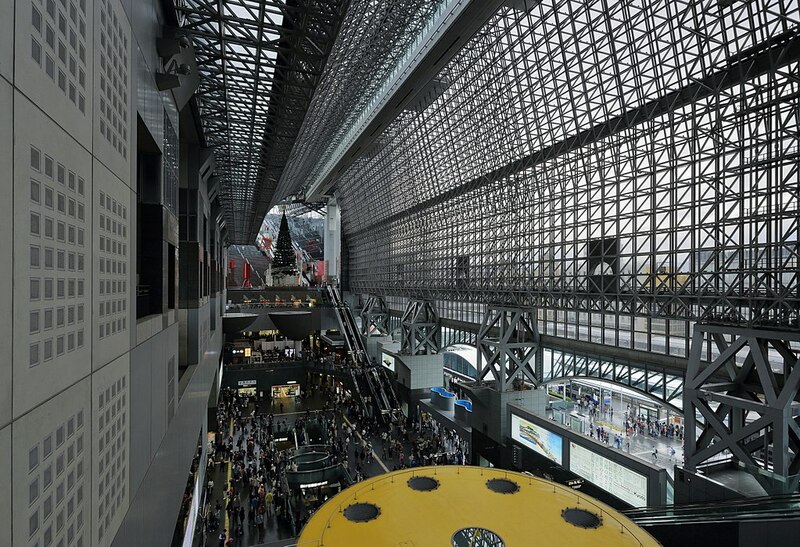 The first Japanese eye-opener was at the Narita terminal having our Japan Railpass validated. The Japanese are sticklers for the correct process and we found we had ten minutes before closing time to book all the seats for all our train travel for the next two weeks. 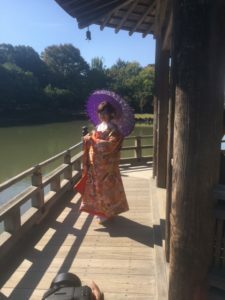 The young lady dealing with us spoke flawless English, though still apologised for its inadequacy, and was as fast as a bullet train, her fingers flying over the booking calculator all the time laughing. We were done in 10 minutes and the door was softly closed behind us on the dot of 8.30. Efficiency+exactness+laughter=perfection! Our hotel is 13 levels high but looks as wide as a little old Balmain terrace – same goes for the room we have. Tiny, and for the first time in my life I got claustrophobia. The window doesn’t open, the aircon seems to have only hot or cold, there is one metre between the wall and the bed for all the furniture and there is no room on the other side of the bed nor at the foot both of which are bound by wall. But the bathroom, though still minuscule, is superbly organised and everything works perfectly. We are staying in Ginza, an old geisha district, but now slick hip and stylish with an amazing wide thoroughfare through the middle called Chuo-Dori with every smart world brand in colourful vertical signs on all the sleek up to the minute towers with glass fronts that line both sides of the street. On weekends it becomes a pedestrian space and most surely be the most elegant shopping street anywhere. We dived out of the rain into the outside lobby of the great Mitsukoshi department store, but found the doors closed waiting for the 10.30 opening and crowds of people waiting to be admitted. On the stroke of 10.30, two elegant female assistants stepped forward from inside the great glass doors, opened then and stood back while the shoppers teemed in. 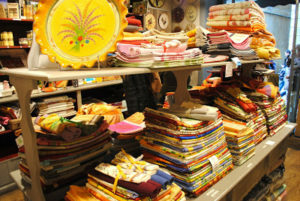 As they did every assistant standing In front of their counters bowed to the waist over and over again as the shoppers swept past. Sally of course pulled out her phone to snap the sight, and then we headed for the basement levels where the arrangements of every conceivable food delicacy have to be seen to be believed. Most of it has to be regarded as art as much of it doesn’t even look like food, or not food you feel you should sully by putting it in your dirty mouth. Some of it was quite grotesque – after all, it was Halloween. After an hour or more of entranced gawking, we agreed to come back in the evening and buy select delicacies for dinner back in our cell. Another amazing Tokyo experience is the trains; not the bullet trains, that’s yet another. No I mean the subway and the surface trains of the so-called JR line (Japan Rail). 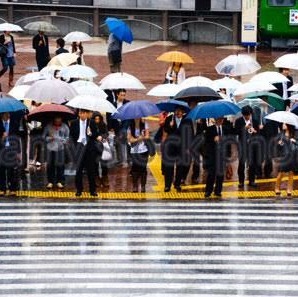 Between them there must be at least 30 lines that intersect the Tokyo metropolitan area. The map is a riot of colour as every line is named and colour coded. They all cross each other endlessly and to get anywhere you have to master the impossibly complicated map. Verging on the Aspergers spectrum as Sally suspects, this is easy meat for me and after an hour or two of intense study, I feel I am an expert and guide a hopelessly lost wife with confidence up and down stairs, escalators, up lifts, down corridors, across concourses, into tunnels, finding the right exit (up to 20 or more for larger stations) and onto multi-coloured trains. During our five days in the city, I believe we were either on or getting to trains or getting off to find another train for more hours of the day than any other activity. But anyone fearing it will be too hard, don’t worry, every sign is in English as well as Japanese. 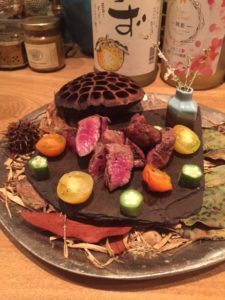 The hype these days about Japan is the food, asserted by many experts including Tetsuya Wakuda, who might just be a bit biased, that it’s the world’s best, combining Japanese finesse with all the great European and other cuisines. But being a musical traveller, I was determined we should visit Tokyo’s premier concert hall, the Suntory Hall, built by an industrial baron. For many years it has welcomed the great orchestras of the world whose world tours always include Suntory Hall. Long before we left Sydney, I looked up the website to see what concerts were scheduled for the time we would be in Tokyo, prepared to schedule our trip around good prospects. 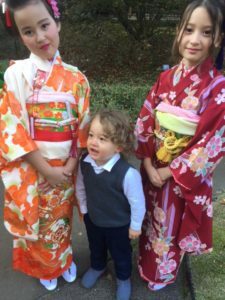 As luck would have it a concert with the NHK orchestra, Japan’s best, with Christophe Eschenbach was scheduled but on the internet from Australia, no seats could be booked. I contacted Ben Ross, son of Fe and Don and a Tokyo resident. He reported it was sold out but his wife Naoko resourcefully got on to an online auction and found us two excellent separate seats. The hall is quite hard to find and our pocket wifi took us on a merry dance to get us there from the subway. Inside it is spacious and clad in elegant pale timber. Eschenbach offered an all Brahms concert – symphonies 4 and 1. The elderly Japanese gentleman beside me told me the Tokyo audience can’t get enough Brahms, and the orchestra clearly lapped it up – the performances of both symphonies were about the most incisive AND expansive I’ve ever heard. A large string section of 60 gave a deep rich sound with strong exact rhythms and perfect security at all times. The typical classical wind and brass sections led by a superb first flute for the gorgeous sad solo in the last movement of the 4th, were all you could want. After a lifetime of listening on and off to Brahms, I was struck by the large part in both pieces for the double bassoon who worked like a Trojan all night, belatedly recognising the origin of the characteristic grumbly sound in all his orchestral music. The concert came to a thrilling conclusion when in the final thrilling bars of the 1st, strangely played after the interval, with the whole orchestra going fff, the timpani, during fantastic ffff rolls, lost one of his sticks, which luckily fell on the drum and it was back in his hand for the final flourish in an instant! To cap a wonderful evening, as we caught the subway back to the hotel, we decided the afternoon snack wasn’t enough and dropped in at a smart looking sushi restaurant a few doors up from the hotel. We sat at the counter in front of one of the two chefs and watched transfixed as he sliced chopped, squeezed and turned the variegated seafood into incredible shapes and then placed them in front of us. The tastes, colours and textures were divine, incredible plus a Pouilly fuisse chardonnay to wash it down. 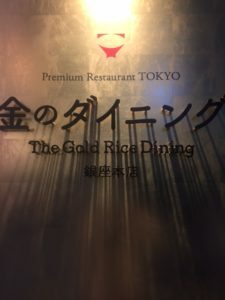 We left an hour later agreeing it was the most delicate and flavoursome meal we’d ever had – The Golden Rice Sushi. 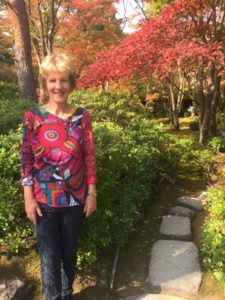 Scrolling through the internet, Sally came across an organisation called Tokyo Free Guides that offers free guiding for tourists. She applied online and immediately had a response from a lady of a certain age called Ryuko – maybe in her 60s. Sally asked I’d she would b available the next day, Friday, and the deal was done. 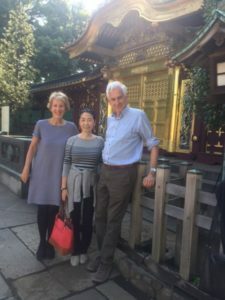 Ryuko agreed to guide us from 10 to 3 pm and we chose the Ueno/ Asakura district to the north of the city, full of older precincts, parks and cultural institutions. It’s a very impressive arrangement and the only cost to us was her bus or subway fares and lunch. She spoke perfect English, has done this for years and sees it as a sort of civic contribution as well,as being a pleasant way to get to meet visitors to her city. She can answer any question you throw at her and you takes you at a cracking pace anywhere you want. She took us to a nice restaurant for lunch high up over Ueno’s busy streets. Over lunch at our questioning she explained their very practical booking system which allows the volunteers to select guests they think they would like. 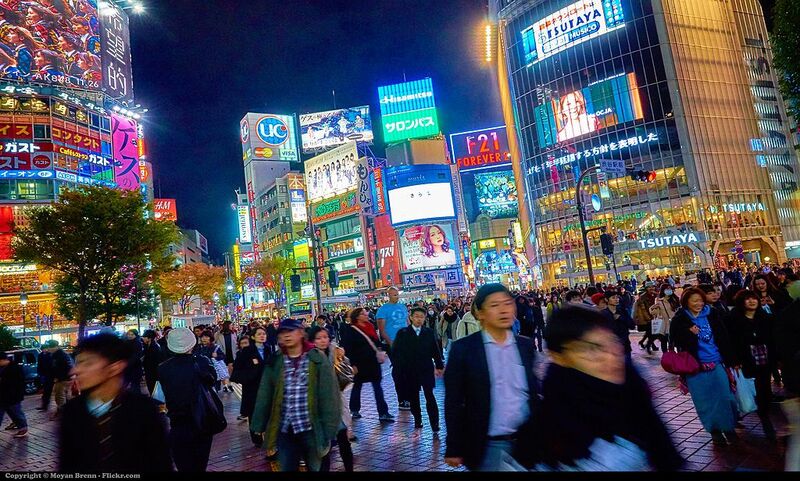 For us the whole experience was most enjoyable and a great way to learn in a more intimate way about Tokyo. Another big thumbs up for Japanese generosity. 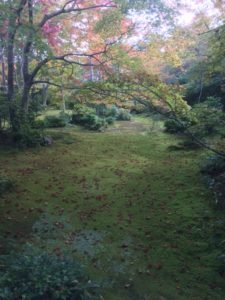 It was Ryuko who recommended the first ancient garden we visited on our Japan sojourn – she also guides in two or three of them. 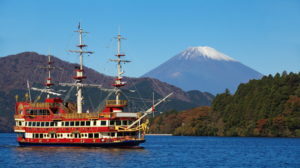 This is one of the most revered – originating 400 years ago but in its present state benefiting from the generosity of the Mitsubishi organisation. 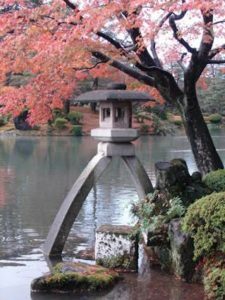 Unlike many, this garden is not integral to a shrine or temple but is redolent of the old Japanese virtues of peace, order, and integration of spirituality with nature. Equivalent in size to a large city block, it is based around a lake with three small islands in the middle. Gnarled ancient Japanese pines, many propped up with wooden poles surround the lake. 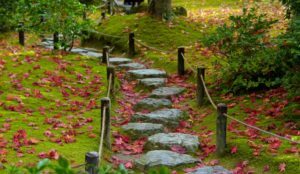 Special stones, or rocks, have been brought from all over Japan to border the garden in seemingly haphazard ways, yet like every beautiful vista in the garden, the aesthetics are so elegant that you can’t help feeling that human intent has merged with nature. The maple and fruit trees, in contrast with the pines, are turning golden, pink and burgundy, though we are told autumn has come late this year and it will be mid to late November before the full autumn glory is reached. 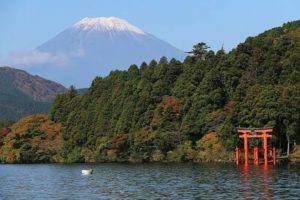 One day, the first really clear sunny day we had, we decided to do a day trip up to the Hakone district where there are beautiful lakes, a cable car over the mountains and the best views to be had of Mt Fuji. All this turned out to be true and in many ways it was a lovely scenic day, but travellers beware: the travel time on the bullet train, then the oh so slow bus, then the pirate ship cruising the lake, the cable car (called the Hakone ropeway), then the interminable straphanging funicular down the mountain, then two more trains to get back to Tokyo – all this meant that 90% of the day was in crowded conveyances, much of it standing. Eating the superbly prepared and presented food is one of the most easily appreciated delights of discovering Japan. Only once were we disappointed during our Tokyo stay. Our last day was solidly wet all day and included a rather gloomy wander ( with another voluntary guide) through the Imperial Palace gardens under umbrellas. 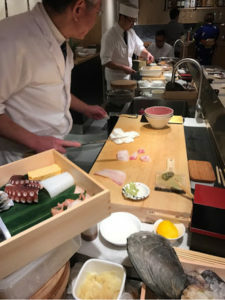 I had booked a special treat for dinner at one of Tetsuya’s top recommendations, the world famous teppanyaki Udai Tei – he spent half a page extolling its mind-blowing virtuosity. We set out in the pouring rain to walk 20 minutes to our destination, Sally very dubious about the whole idea. I realised it would be costly so steeled myself to as much as $300 for the evening. It was hard to find but find it we did like drowned rats, and were greeted at the street by a charming hostess. A glance at the menu options at the door showed the cheapest option would cost $350 each, not including drinks. I never made a faster decision – we were off into the night before Sally even knew what was happening! Eventually, even wetter, we found a lovely modern/ traditional place where we had a delicious multi-course dinner for about $80 each, a far better way to cap our Tokyo stay. 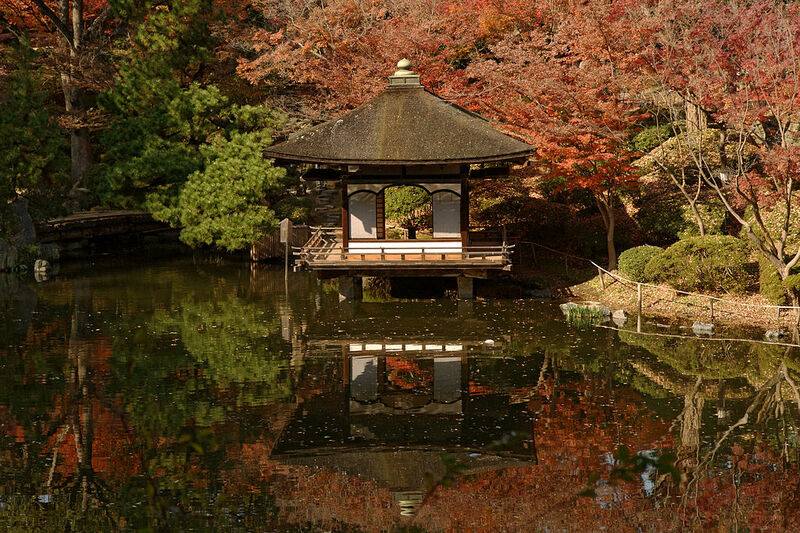 Situated on the mid-west coast of Honshu and noted for its maritime culture, Kanazawa proved to be a fascinating place. Nearly three hours on the bullet train was more like a magic carpet ride and we drew into ultra modern Kanazawa station on the minute. As with most major Japanese cities, the station has everything – malls, high rise hotels, department stores and everything in between. 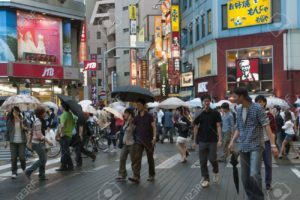 Just as well as the weather on our arrival was foul – like Tokyo only worse – and trapped us (at least Sally) in shopping mode – new shoes, new bag while yours truly minded the luggage. It was almost dark when we made it to the hotel – sleek looking in the reception area, but again a tiny room with locked window encouraging claustrophobia. 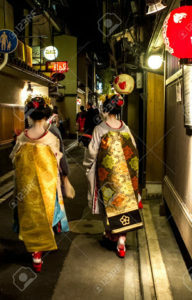 But this hotel had the advantage of its very own onsen, Japanese for bath house where men and women, separately, go through the naked cleaning and bathing ritual. I found it very pleasant, if a little disconcerting. Sally couldn’t wait to enjoy the experience but unusual circumstances made it VERY disconcerting for her, but that’s a story to be told by her at another time. 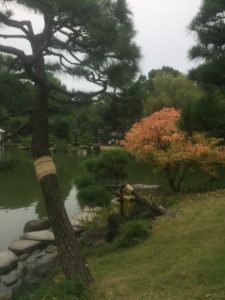 The next day, our only full day in Kanazawa, mercifully stopped raining, though the clouds were low. It turned out to be perhaps our best day in Japan yet. 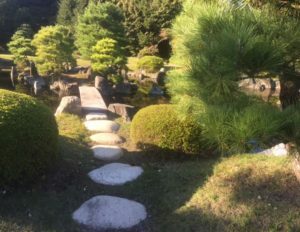 We headed for the Kenruko-en Garden, one of the supposed three best in Japan. The autumn colours were splendid and the paths wandered through an extraordinary variety of small vistas including two small lakes, a quite steep hill over looking the whole garden, avenues of exotic tiny trees, some with leaves in brilliant red and others in various hues from soft yellow through to pinks, oranges and burgundies, all contrasted with the bright greens of the pine trees. Across from the garden was the contemporary Art Museum, much praised In the blurb in our Lonely Planet guide. It is a big airy building, all white and glass panels with high ceilings. The exhibition filling it, I don’t know whether it was permanent or not, was devoted to the idea of new ways of living for the new age. Much of it celebrated a link between Danish and Japanese design and was full of fanciful and fabulous as well as more serious concepts. A Danish artist called Helman(?) Lehl (?) had lived on Okinawa in a beautiful beach house for many years and during this time had been disturbed by the huge amount of detritus washed up on the beaches, all cheap plastic bottles, rope and other rubbish. He was so concerned about this ruination of the pristine landscape that he decided to draw attention to the issue by creating an art collection based on this colourful rubbish and published a book devoted to the amazing series of art works. We turned into the next large room and there it all was, in great hangings, pillars, installations and extravagant chandeliers, distorted and exaggerated in crazy mirrors around the walls of the huge room. 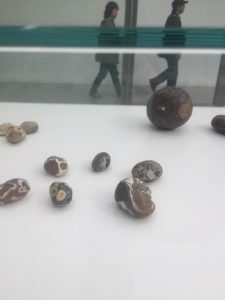 There was another exhibition of his of found stones he discovered quite by chance somewhere in India, none larger than a fist but all with extraordinary coulours and tracery. Apparently these are mostly agate. The museum was full of droll and serious exhibits, superbly presented, always in English as well as Japanese. I could have stayed there all day. 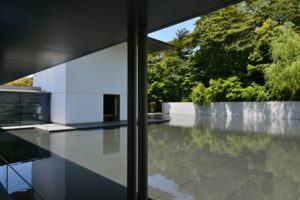 Almost next door is the DT Suzuki museum, a permanent tribute to the famous Japanese philosopher and exponent of Japanese Zen Buddhism who lived a very long life from the late 19th century until 1962. 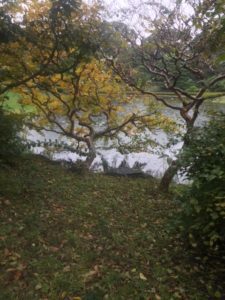 It is housed in a beautiful purpose built house in a lovely setting on the side of a wooded hill, exuding a peaceful contemplative atmosphere with a shallow infinity lake and paths through the woods. Perhaps the most notable teacher of Zen Buddhism of the 20th century, he fell foul of many colleagues with his mid-century glorification of Japanese swordsmanship and its association with militarism. On our way back to the hotel, we stopped at the Omi-Cho market that apparently rivals the Tsujita fish market in Tokyo which we missed. Not only the seafood, but the bewildering variety of fruit and veg (the ubiquitous persimmon and nashi apple/pear). I bought a cup of halved fresh figs having a wonderful depth of flavour, but the real mouth bursting experience was a single massive oyster I bought at one stall. I saw these huge gnarled pieces of rock the size of a small pineapple and wondered what they were until I saw a woman buy one for 5000 yen ($6). The stall owner went away and brought it back opened with a giant oyster inside, perhaps 12-15 centimetres long. I gaped, bought one and ate it with chop sticks in three pieces dipped in the offered lemon juice. What a taste explosion! I let nothing pass my lips until dinner so I could savour the after taste. The exquisite Japanese cuisine has now become a national pastime and everyone partakes of it. One of the eating phenomena is the restaurant floor, or two, at the top of every department store and now at the top of modern hotels. These might contain 20 or even 30 restaurants of every different style of Japanese cooking plus plenty of foreign fusion styles too. All of them, cheaper and more pricey, seem to be full, with rows of chairs outside each one; people waiting for up to an hour to get in. At least in the smarter stores and hotels, these are not takeaway el cheapos, but both casual and more formal fine dining places, many where the diners sit at counters while the wizard at the hotplate does his stuff. In Kanazawa, on the top floor of the 5 star station hotel, we entered a place where each table had a little double bowl deep fryer heated by a tiny flame the diner can adjust. The waiter then pours an aromatic stock into the bowls and we are given an array of raw vegetables, condiments, pickles and thin slices of pork or beef that we each cook to our taste in the stock. To the uninitiated like us, it’s a bit messy, but delicious and we left very satisfied. 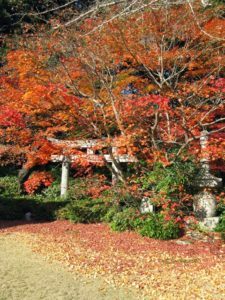 For our last day in the country we decided to go to Nikko, a town in the mountains two hundred kilometres north of Tokyo, noted at this time of the year for its magnificent autumn colours and its fantastic World Heritage listed temple complex Tosho-gu. 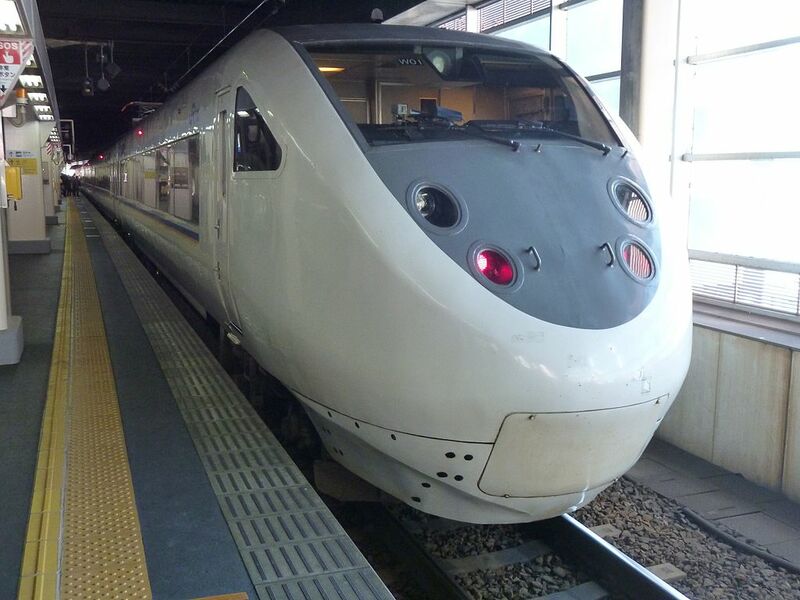 It meant the bullet train back to Tokyo and two more trains to Nikko, arriving in the afternoon. It was lovely to find we were in a modest town rather like a ski village high in the mountains. With an hour or two before the sun went down, we took a bus to the former Royal retreat, a magnificent traditional all-wooden villa in the midst of another gorgeous garden with a little stream running through it. 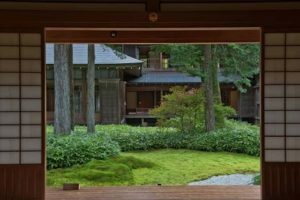 We loved the elegance of the many simple wooden rooms with tatami floor coverings, looking on to pretty internal courtyards to out the garden. 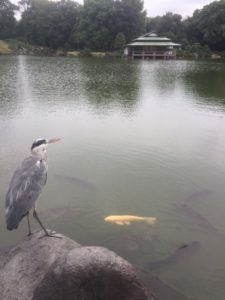 As our flight left Tokyo in the evening the next day, Sally decided she wanted to walk in the National Park around lakes high in the mountains before we left. We had a quick visit to the famous shrine complex but despite its spectacular appearance, the hordes had arrived early in the day and we beat a retreat to a bus taking to the mountains, labouring up dozens of hairpin bends till it got to a beautiful high lake called Chuzen-Ji. A walk around the lake could have taken a couple of hours, but my knees had given up the ghost so we sat on a crumpled old wooden jetty and gazed at the lovely lake and the mountains surrounding it and talked about our remarkable journey and pondered many thoughts and reflections about Japan and life in general. It was a very special way to end our trip in a slow and relaxed way. Eventually we got up and went to a superb craft shop and bought some lovely implements to take home and finally caught the bus back to Nikko and thence the trains to Tokyo and the airport. What were our lasting impressions?! A busy, thriving, highly integrated society, charming and welcoming to strangers, but as a friend says, happy to see you leave fairly soon. A lasting impression for me was the ease and contentment of their lifestyle. Smiling and chatting constantly, you rarely see, at least in public, an argument or discord. The cities are immense: from the train you see huge districts rushing by of seemingly endless high or medium rise accomodation towers and blocks. But the people seem completely untroubled by the density of their living style. Admittedly we were mostly in large sophisticated cities but we saw no poverty or discontent even in the poorer side streets. The fact that most of the thronging crowds visiting the sacred sites were Japanese was fascinating to me. 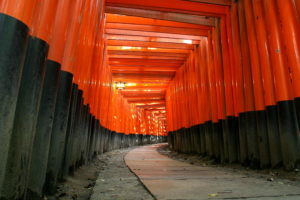 The spirituality of these places is clearly a daily part of the lives of all Japanese. They visit these places constantly, not to worship, but to be there, to partake of that spirituality as prt of their almost daily lives. It is very impressive and clearly is a strong bond for the whole . Some ask how can this be when you remember the cruelty and militarism of World War 2? I think the trauma of the war changed the whole society, no doubt encouraged, even dominated by the post war influence of the US. Tour finishes with Mahler’s 9th at Concertgebouw! 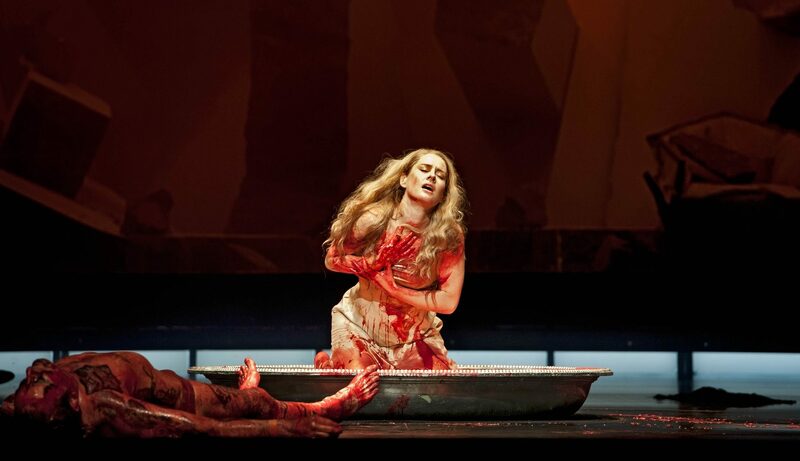 At the Dutch National Opera last night we saw a Salome of Richard Strauss that was nothing short of sensational. This was the sort of operatic performance, opera buffs dream of! The Salome was Malin Bystrom, a Swedish soprano with the sort of high effortless sound that cuts through the huge orchestra and never falters. In a truly terrifying performance, looking like a spoilt young demi-mondaine in a slinky white dress, and having been delivered with the blood soaked body of John the Baptist, she staggers through the pool of blood and lies on top of him singing her final phrases with thrilling and abandoned assurance. At the final curtain, the shocked silence finally broke into endless cheers and roars. It was the premiere of a brilliantly simple but dramatic new production by Ivo van Hove, featuring the Royal Concertgebouw Orchestra in a rare appearance in the pit conducted by their new music director Daniele Gatti. On a perfect sunny evening on our second day in Amsterdam, we all walked down the street next to a broad canal heading for Ivo Janssen’s houseboat. To my great surprise, we were suddenly joined by Servaas van Beekum, my good Dutch friend from Sydney, visiting his family in his home town of Amsterdam. He was with his and his daughter Silke and we all crowded on to a large house-boat crowned with a fully fledged garden across its entire roof. 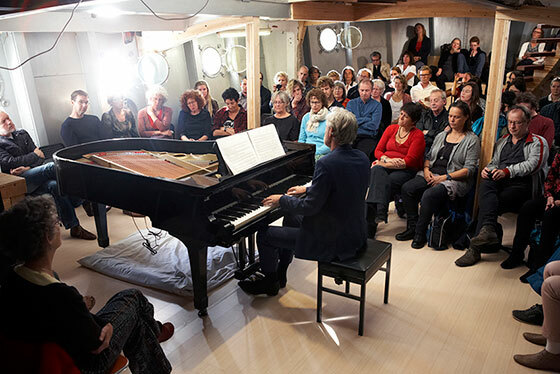 Ivo, one of Holland’s leading pianists, had become sick of dealing with agents and travelling the world playing concerts, so decided to convert an old concrete barge to both a home and an intimate concert hall. Over several years, he rebuilt it himself with help from friends and it is now a beautiful double level recital hall seating 140 people, and includes his own apartment at one end of the boat. We were treated to a mesmerising performance of one of the greatest works of the keyboard repertoire, JS Bach’s Goldberg Variations. Having met Ivo some years before through out mutual friend Don Ross, I rang him from Sydney to ask if he would play for our group and he agreed provided we didn’t mind if he sold the remaining tickets to the public. Asking me what I’d like him to play, I had no hesitation in asking for the Goldbergs. It was an evening none of will forget and afterwards I bought his recording of all Bach’s keyboard works – on a set of 20 CDs! 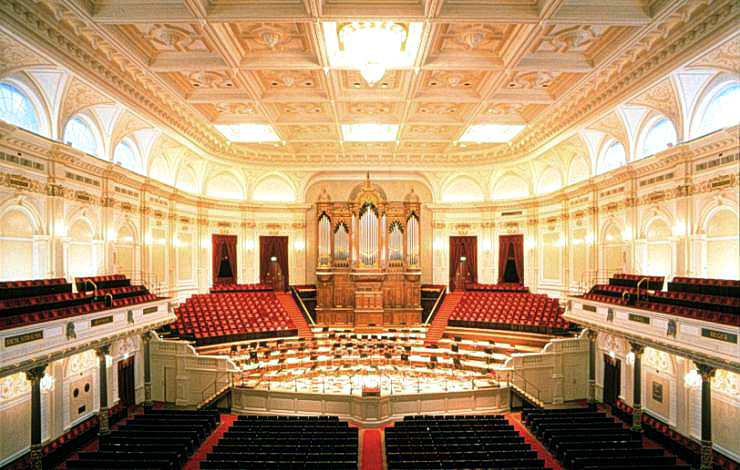 We have just arrived in Amsterdam from Regensburg, after four days of their fabulous annual festival Tages Alte Musik. 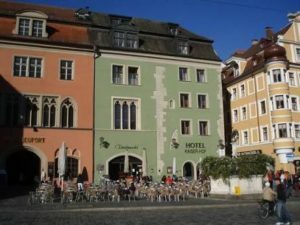 Regensburg is an ancient mediaeval town in Bavaria that is one of the very few in Germany to escape the destruction of World War II and its streets of old baroque houses, leaning buildings, and magnificent churches give you an uncanny sense of being in another ancient world. Over four days, 16 concerts are given in these extraordinary old churches and mediaeval halls, mostly large, and even cavernous, and some with the most extravagant rococo decoration. Hearing wonderful, mostly unfamiliar music from the 15th to 18th centuries, mostly featuring period instrument and vocal ensembles from all over Europe, was really inspiring and gave us many touches of the sublime in music. Particularly memorable for me were Musica Fiata & La Capella Ducale in a re-creation of a Mass for the Reformation festival in Dresden in 1617 at the Dreieinigkeitskirche, Ensemble Alia Mens singing Bach cantatas at the amazing Church of out Lady, and the English vocal ensemble the Gesualdi Six singing Tudor music of England late at night in the huge Scottish Church. As a contrast to all the early music in these solemn and beautiful churches, we had a whole day in the magnificent countryside including a spectacular boat trip down the Danube gorge.